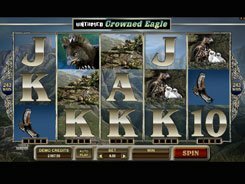 This 5-reel 15-payline slot is based on a famous oil painting by Coolidge depicting dogs at table playing poker. 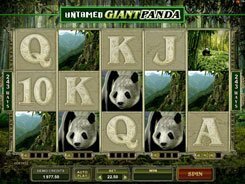 The slot features a scatter symbol, a wild, and a bonus round. 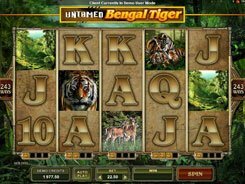 The maximum wager is set at $30 per spin to suit all budgets and bankrolls. On the reels you will come across a smoking dog, a dog with an Ace of Spades, a dog with casino chips, a tied kitten, etc. 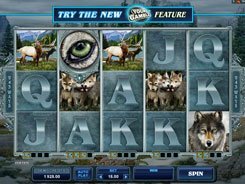 A wild represented by the slot’s logo can surprisingly replace for ALL symbols including a scatter, which in this case is the Doggy Time symbol. 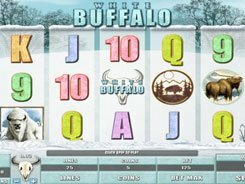 The top jackpot prize you can potentially win is $30,000; this is paid out for five wild symbols occurred on any payline. The second-largest prize of $10,000 is paid out for hitting five Dogs with Cards. Three or more scatters trigger a bonus round with six dogs playing poker and up to six picks available; each dog you have chosen will reveal a random cash prize. 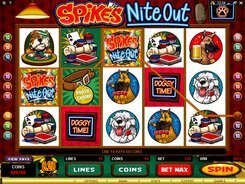 Overall, Spike’s Nite Out is a nicely designed game with smooth gameplay, flexible betting options and a non-clichéd theme. PLAY FOR REAL MONEY!